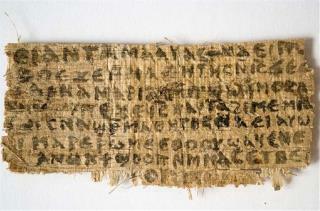 (Newser) – To call it controversial is putting it mildly: Harvard professor Karen L. King in September 2012 debuted an ancient papyrus now known as the "Gospel of Jesus' Wife" at a conference in Rome. The papyrus makes an explicit reference to the woman's existence with the line, "Jesus said to them, 'My wife...'" Now, extensive testing by professors from Columbia, Harvard, and MIT in the fields of electrical engineering, chemistry, and biology has found no indications that it is a modern forgery, per an article by King published today in the Harvard Theological Review. The Boston Globe says it most likely dates to eighth-century Egypt, and the chemical composition of its ink is in line with the carbon-based inks the people of that country used at the time. Why do they assume it is the Jesus of the Bible? Yeshua (Jesus) was a popular name at that time, in that area. The bride of Christ is the CHURCH. Romans 7:1-4,Ephesians 5:22-25, 2 Corinthians 11:2, Revelation 19:7.